For large surface work pieces where the router must go to the work, the newly improved CRB7 MK3 Router Base from M. Power Tools offers a stable router platform to cut edge moldings, dadoes, mortises, circles, and indexed parallel grooves with micro-adjustable precision. The offset design and included anti-tilt leg provide excellent anti-tilt support when routing.� This package also includes the CRB7 Edging Trim Kit, which gives you the ability to flush trim either solid or banded wood edging. Plus you also get the CRB7 Edge Guide Side Fence Kit, which lets you rout with micro-adjust precision working from the edge of the board. 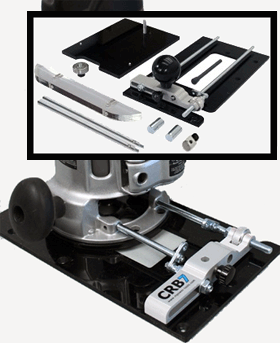 Fitting the CRB7 MK3 router base to your favorite router couldn't be easier. Select the correct sized guide rods for your router and the crank plates will adjust rod height and width simultaneously to fit your router edge guide holes. It takes only seconds. Off Set Base Plate - Doubles the surface contact area between router and work piece when edge molding. Anti Tilt Support � Anti-tilt leg support eliminates router tilt. Adjustable Mortising - Unique feature that allows centered or off centered mortises. Small Circle Compass � Cut out circles that are actually smaller than the base of the router plus micro-adjust the circle diameter from 1-1/2� to 17-1/2". New Large Circle Compass - Cut circles up to 48" in diameter. Adjustable Clamp Guide - Route a parallel dado along the length or width of your work piece plus micro-adjust the placement. Adjustable Dado Copier � Use indexing to accurately space a series of repeating dados. Side Fence Kit � Large fence provides control, stability and micro-adjustment when edge profiling without a bearing guide. Also cuts grooves or dados up to 7-1/2" in from the board edge. Edging Trim Kit - Riser base that allows flush triming of a dowel head or wood edging.� A tracer bearing removes the need for visual guidance of the router along the path of wood edging.